Laminate furniture is compressed wood mixed with other particles that are covered in a thin laminate (plastic-like) surface to keep it from fraying as well as make it resemble wood furniture. As you can kind of tell from this close up of one of the legs of the desk, it had started expanding and warping from sitting in water. 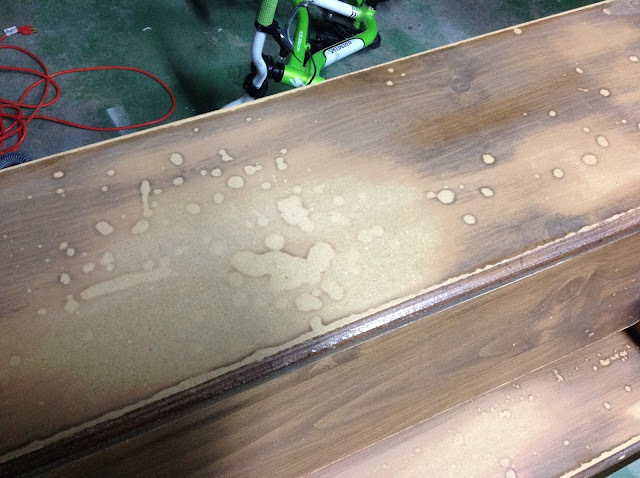 On the top of the desk, as well as the writing surface, there were these "laminate bubbles". 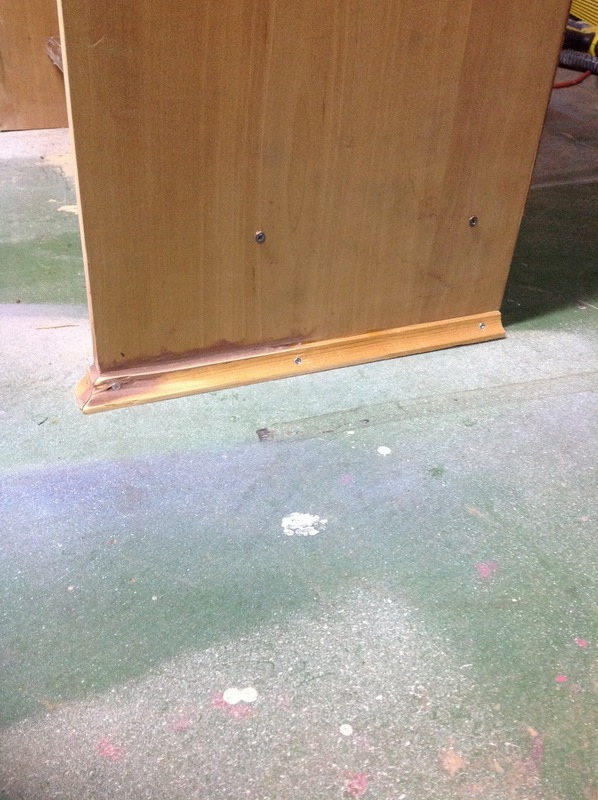 The water had soaked through the top surface and the particle board underneath had expanded and dried. The one issue I was told was a problem before getting it was that the rolltop wouldn't open all the way. I took off the back panel and saw that an old Disney cassette tape had fallen back behind the rolltop area and was preventing it from sliding all the way up. Simple fix! The two culprits that were preventing the rolltop from doing its job---rolling. The rolltop portion was not made of wood either, and actually looked very cheapy. Because there was the fold out desk that looked nice when closed, I decided the rolltop was redundant and could be removed. With all of the damaged laminate though, I was afraid that this whole desk needed to be replaced anyway and maybe was worth the FREE pricetag. Thankfully I decided to give this cute little desk a second chance. I did some research and found that sanding down the damaged laminate works. I was skeptical but figured I had nothing to lose. I used 150 grit sandpaper on my Makita palm sander and went back and forth with the fake grain until every bubble was removed and the surface was level. I replaced the water damaged legs with some other wood I had on hand since I wanted the desk to be structurally sound and have a long life. I used the original legs as a guide and cut the two legs to size as well as used a router to carve out the places where the footrest board and desk's surface needed to fit in. (I chose to get rid of the curvy shaped outline the original legs had since there was no point for that design and I thought it was ugly). I then screwed in the top of the desk as well as the desk and foot rest portions, and then used my miter saw and cut some thin decorative molding (is that what that is called?) to provide a more finished look. (I would have nailed these to the base but I am horrible with a hammer and nail. A nail gun is still on my list of "Wants". 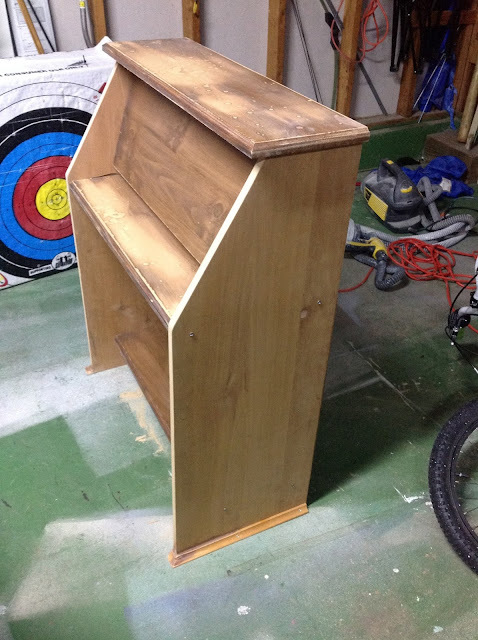 I used some wood glue, then screwed in tiny screws, then used some wood filler to fill in any gaps). 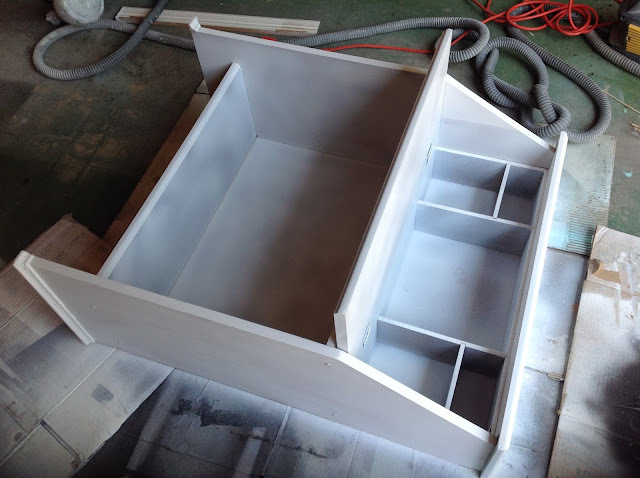 I laid the desk on its back for the entire painting process because I wanted to paint the bottom of the feet of the desk and there was no point in painting the back since it was going to be up against the wall. Now that everything was primed there was no more evidence of the water damage. Perfect! I then used my sprayer and painted the desk gray. I did about two coats and let it dry. Everything looked perfect, but a little too boring for my boys' room. Some stripes would take it to the next level. As much as I hate using painters tape, it is crucial for having perfect lines. That is unless you are one of those freak of natures that have a super steady hand and can paint perfect lines with a paintbrush. If you are one of those few you should have been a surgeon, not a painter. Anyway, I suggest using the best brand of painters tape, not the store brand. The store brand gets all wrinkly when really wet with paint and doesn't stay down as well. I also like the wider tape, but if you want skinnier lines then go with the skinnier tape. Put down your tape after measuring your lines, where you do NOT want the new paint color to show. Take the base color, which in my case was the gray paint, and paint over the edges of your tape where you will soon be painting the new color. Let the base paint dry. This will prevent any of the new paint color from bleeding through tiny gaps in the tape. Paint the new color within the tape lines, and slightly on the tape to make sure the whole section you want painted is painted. Let dry. Remove the tape and take a bow. Seriously, you will feel like bowing when you see you perfect your lines are. To complete the project and allow my boys to use the desk for their homework, I used a folding chair we kept in storage. I barely sanded it down and then cleaned off the dust with TSP substitute (little water and soap works great too). 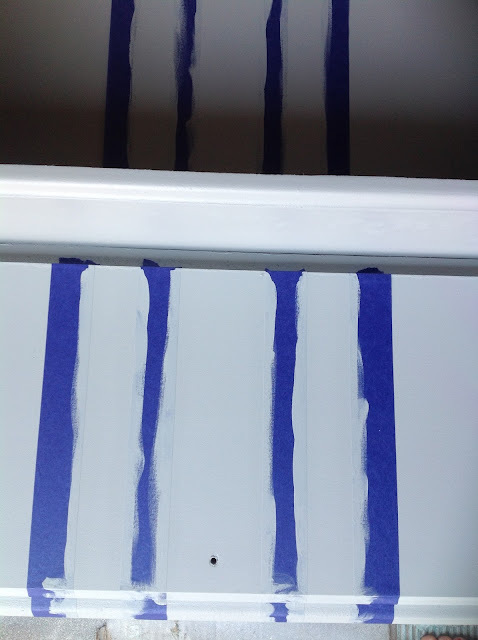 I took out my Wagner and sprayed it gray like the rest of the desk, and then used a mini paint roller to roll on the same paint color I used for the stripes on the desk (a combo of leftover blue paint with chalkboard paint). Isn't that little pull down so fun?! I love how it closes up their soon-to-be-messy workspace, yet the desk is small and compact for the tiny bedrooms we have. 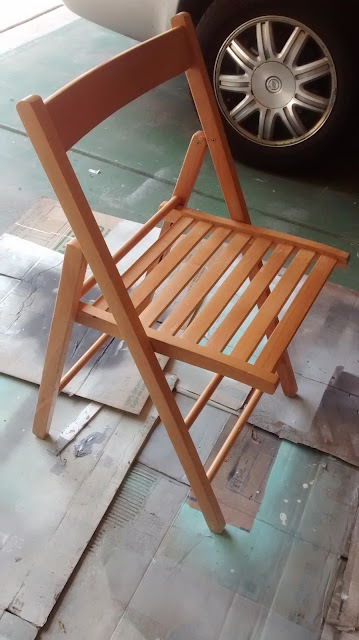 Isn't it amazing what a little sanding and paint can do?! 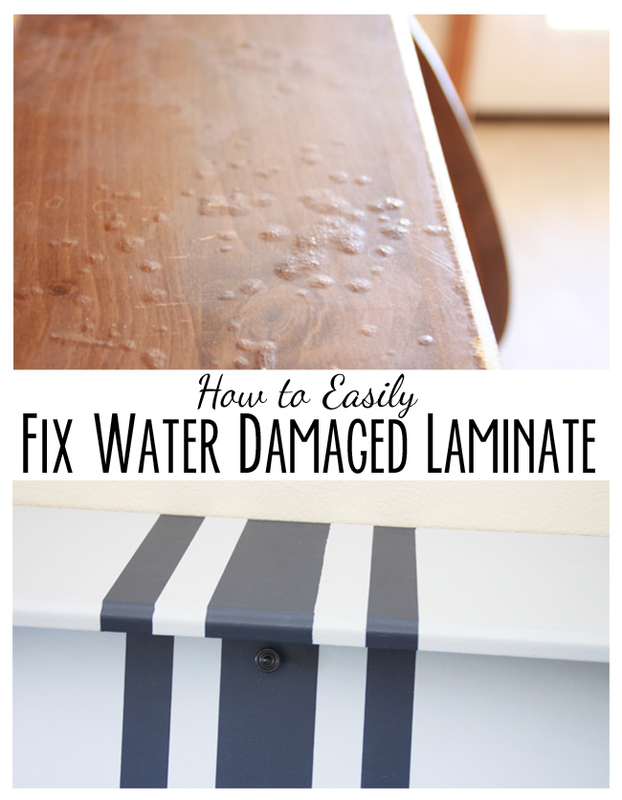 Have you been able to save a piece of beaten up laminate furniture? Or do you have any other tips to make awesome lines? Please share because I love hearing and learning from you! Great save! It turned out so cute!!! Thank you for the great bubbled laminate fix and painting clean stripes tip! 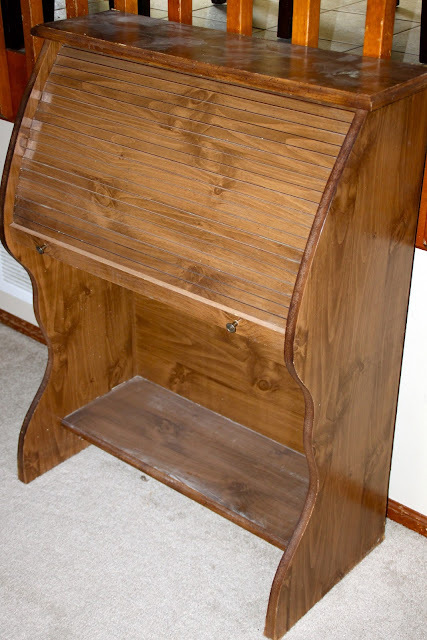 Was looking to restore my daughters desk that she uses for makeup, this is perfect. I know just what to do now! 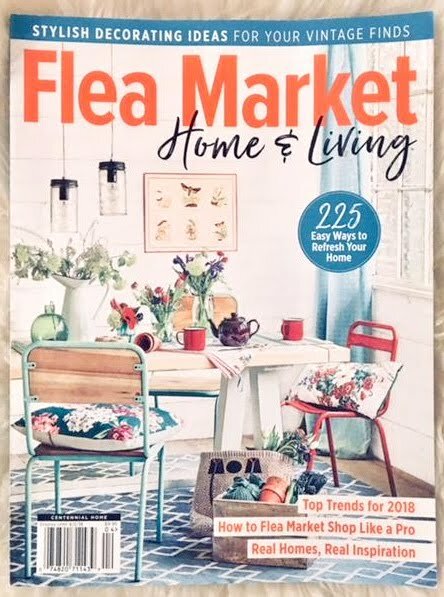 That makes me so happy that this helped you get your creative juices flowing! Good luck and have fun!